Routines and Transitions is a complete guide to help you turn the most common daily activities, such as hand washing, snack time, and naps, into nurturing learning experiences for children ages birth to five. By using transitions wisely, you not only contribute to children?s developing skills but also run a more efficient program and create a calmer early childhood setting. In addition to discussions on developmental issues, environments, educational values, and hygiene, there are examples of the kinds of games and rhymes that help children move through their daily transitions with ease. 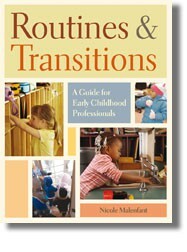 Not just another activity book, Routines and Transitions is the most comprehensive review of current theory and practice available on these topics and is an excellent introduction and training manual for new child care staff, as well as an in-depth refresher course offering new insights for experienced caregivers.